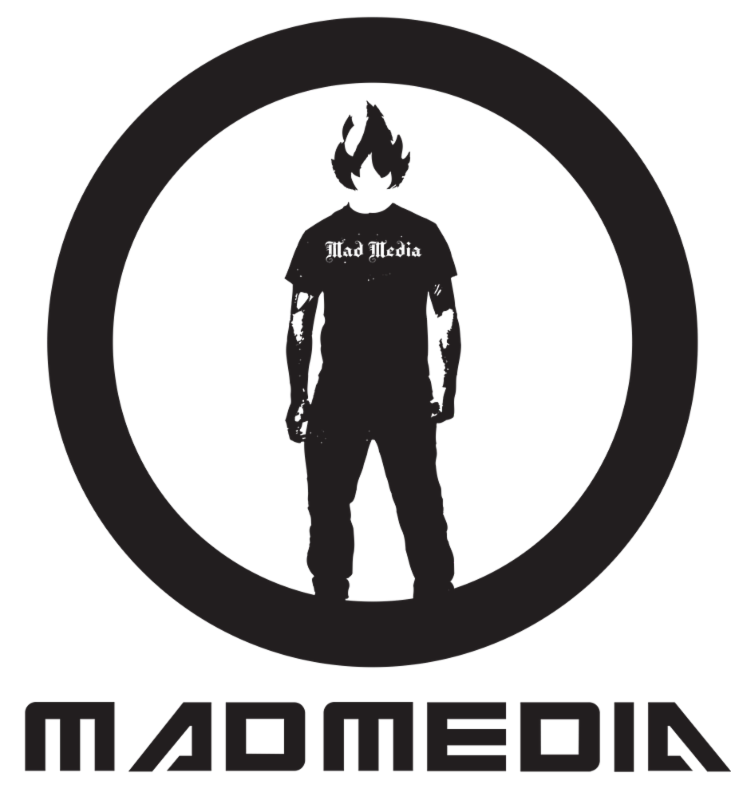 For 2019, the nomination packet is available online. 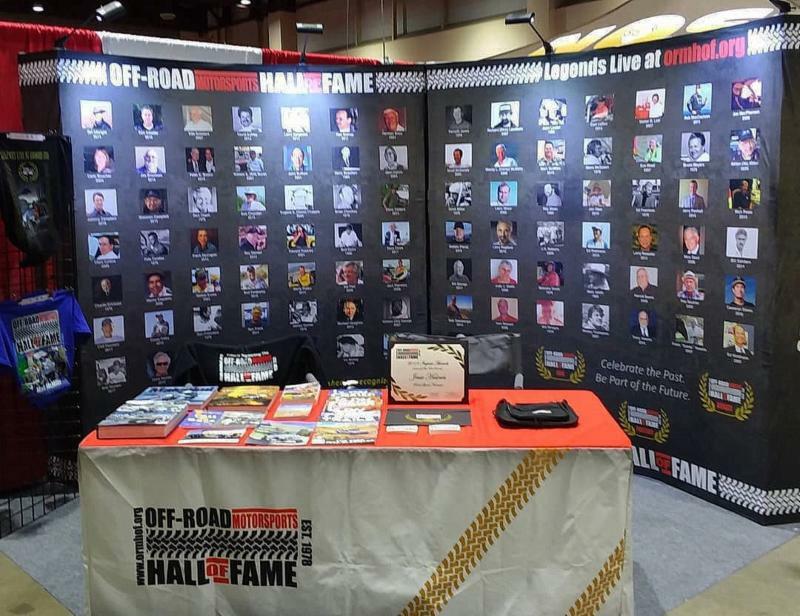 If you'd like to nominate someone for the Off-Road Motorsports Hall of Fame, please review the 2019 Call for Nominations before completing the online Nomination Form. 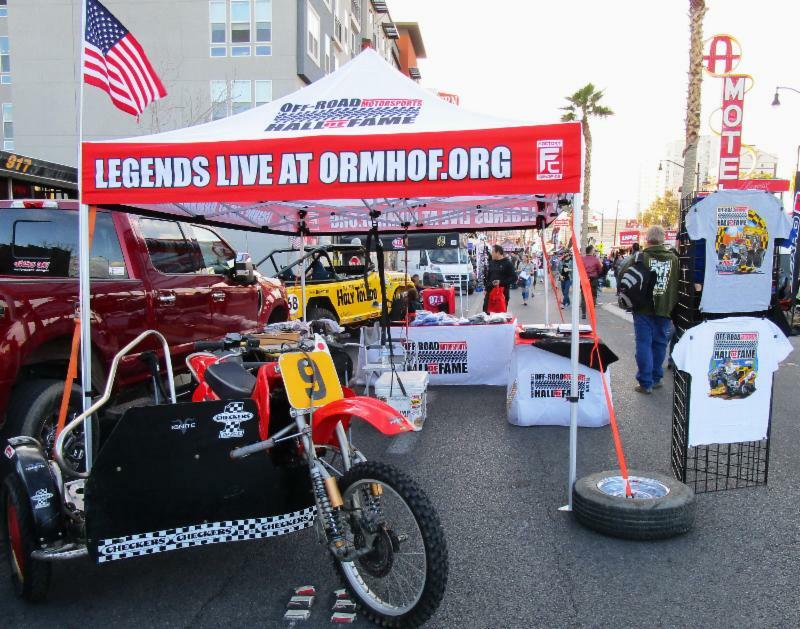 The Class of 2019 will be welcomed into the Off-Road Motorsports Hall of Fame on Sunday, November 3, at off road's biggest night of the year, the ORMHOF Induction & Awards Ceremony at the South Point in Las Vegas. 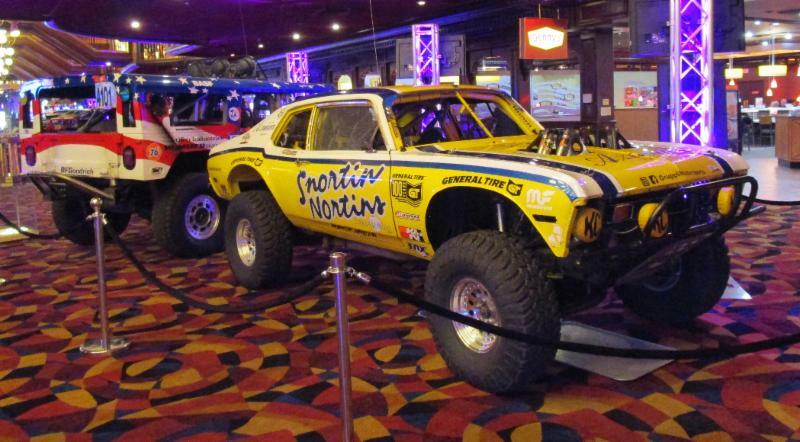 Snortin Nortins Nova: The family of the late Florian Oger has honored his wishes to preserve the Snortin Nortins Nova by displaying it at the Off-Road Motorsports Hall of Fame located inside Terrible's Casino in Jean, Nevada. Originally built by Larry Tunnell and Mick Newton, the Nova was named after Newton's screen printing business, Snortin Nortins. The Newton family raced the Nova throughout the 1980s. 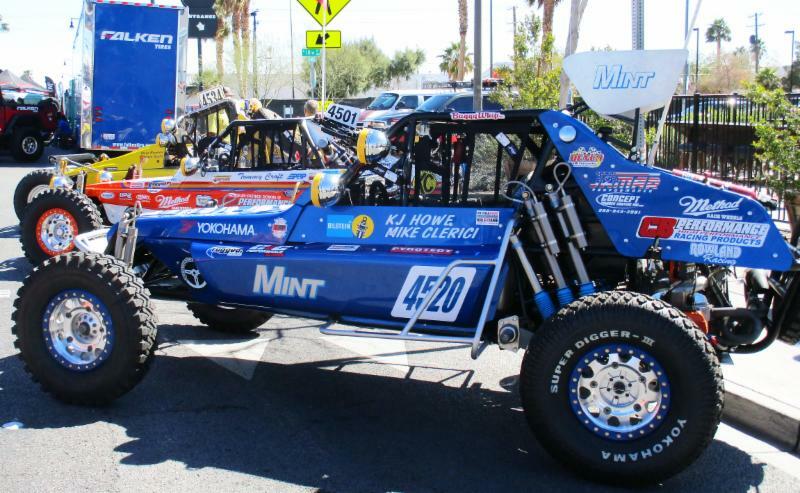 The car was a head-turner at events like The Mint 400 and Baja 1000. 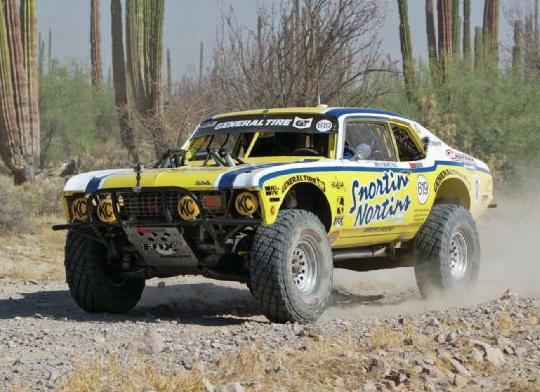 The car was sold and was eventually rescued from obscurity by Rick 'Hurricane' Johnson, who, with the help of friends, prepped and raced the car in the NORRA Mexican 1000 in 2011-13. The most recent owners, Florian Oger and his son Alex, raced the Nova in NORRA in 2015-17, making some great father-son memories before Florian passed away from cancer. Racing photo credit (Left): FourWheeler Network, Photo (Right): The Nova on display at the Off-Road Motorsports Hall of Fame in Jean, Nevada. 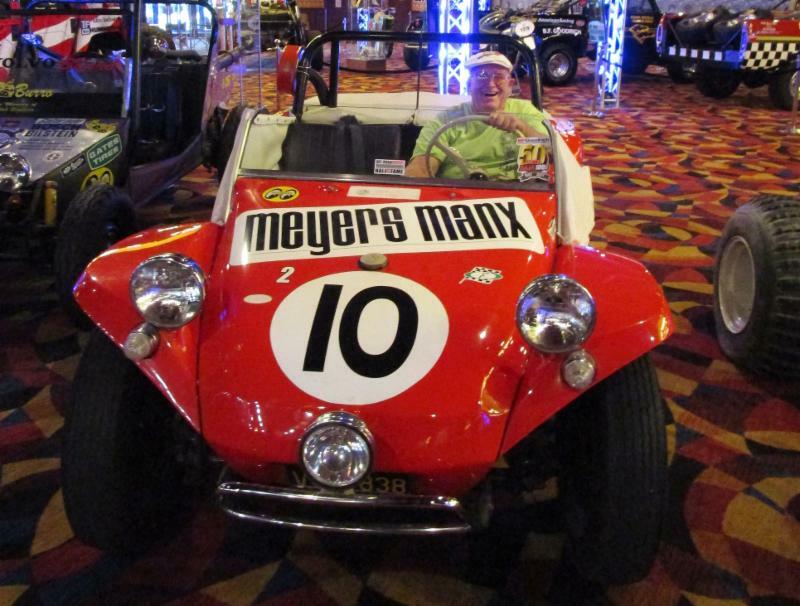 Meyers Manx 10 Car: A replica of historic 'Old Red', Bruce Meyers first beach buggy, the Meyers Manx 10 Car set off from Tijuana on April 19, 1967 in an attempt to break the Tijuana to La Paz record set by motorcycle riders Dave Ekins and Billy Robertson Jr in 1962. Bruce Meyers and Ted Mangels arrived in La Paz 34 hours and 45 minutes later, beating the time set by the motorcycles by more than five hours. 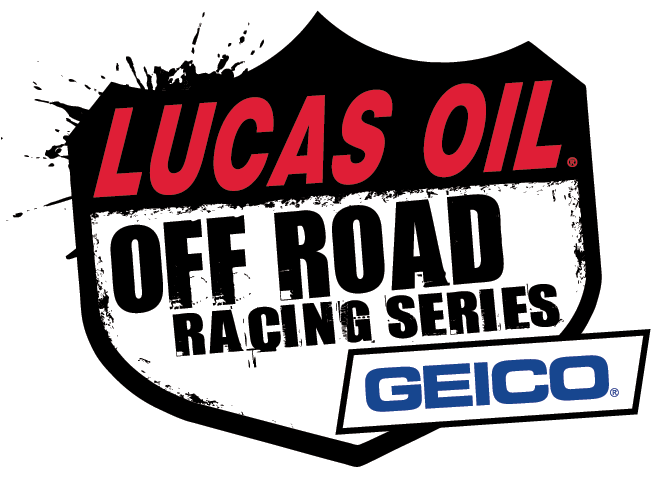 The publicity generated by the event led to the creation of the Mexican 1000 race organized by Ed Pearlman and the newly formed National Off-Road Racing Association (NORRA), with the first race held later that same year. Photo (Left): Bruce Meyers and Ted Mangels with Old Red in 1967. Photo (Right): Jim Chamberlain maneuvers the Manx 10 replica into place at the Off-Road Motorsports Hall of Fame museum in Jean, Nevada. 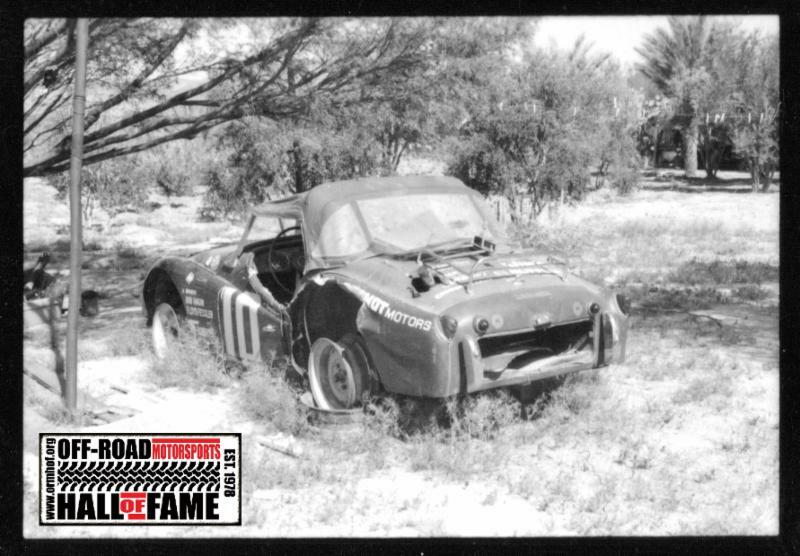 Baja 'Survivor' Triumph: One of 68 vehicles to leave the starting line at the inaugural Mexican 1000, this 1959 Triumph TR-3 was essentially stock, except for skid plates, the addition of the roll bar, a relocated gas tank, some driving lights, and a spare tire, which was attached to the luggage rack. Woefully ill-equipped, the Triumph basically destroyed itself after about 300 miles, coming to rest at Rancho Santa Ynez, a tiny outpost near Catavina, where it remained for several decades. Bruce Meyers would stop and 'visit' the Triumphh whenever he was traveling through Baja. In 1998, volunteer race crew member Alan Brickey noticed the Triumph off in the weeds and decided to set about rescuing it. In 2001 Brickey returned to Santa Ynez, paid the rancher $100, and hauled the remains of the Triumph back across the border. More than a decade later, Brickey put the Triumph up for sale, never able to complete the restoration. Eventually the Triumph was lucky enough to fall into the hands of former Ferrari mechanic Lyman Scherer, who restored the car to 'better than new' condition. Lyman, his wife (she's actually the driver of record), and friends, made a Triumphant return to Baja with the TR3 at the 50th NORRA Mexican 1000 in 2017, finishing the race. 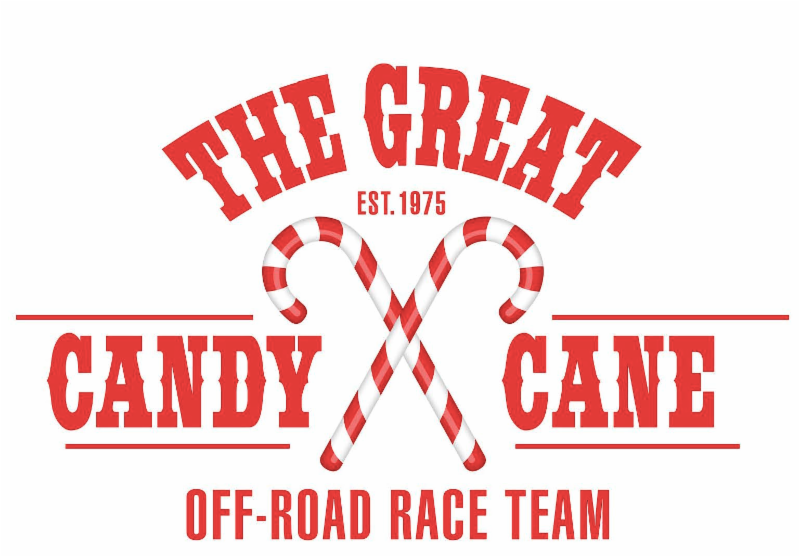 They raced, and finished, again in 2018. In fact, the car hasn't been washed since it crossed the finish line, so you may notice a little dirt and dust from the Ensenada wash and dried champagne from the finish line celebration on the car when you visit. Photo (Left): Inductee and Dusty Times editor Jean Calvin took this photo of the Triumph while pre-running for the 1968 Mexican 1000. 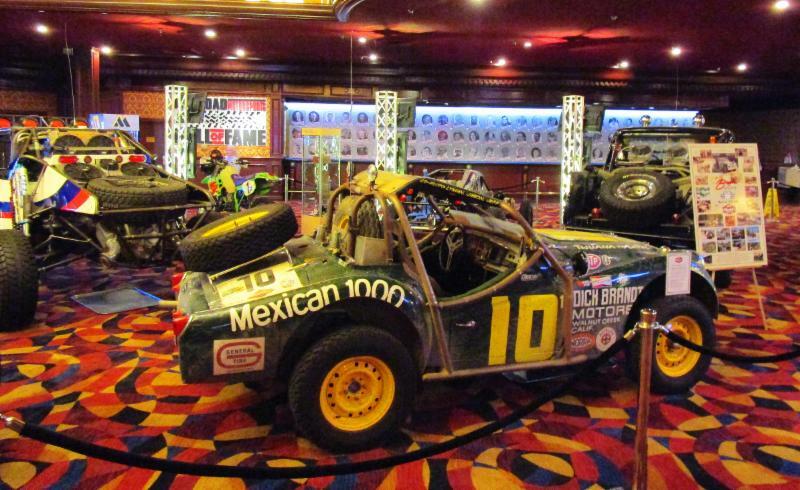 Photo (Right): The Triumph on display at the Off-Road Motorsports Hall of Fame in Jean, Nevada. Thank you to everyone who joined or renewed at Parker - Vegas - Reno! 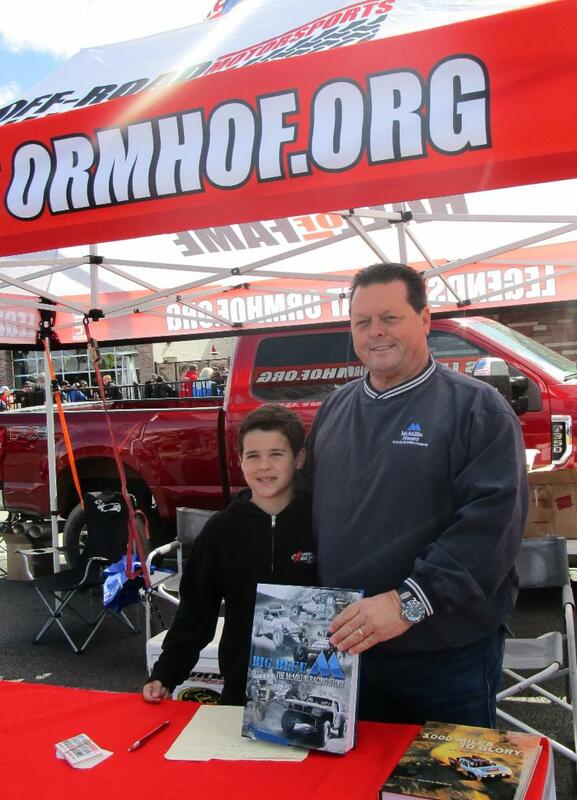 Photos L-R: Inductees Rod Hall and JN Roberts at The Mint 400, ORMHOF T-Shirt front with 2018 Inductees Cameron Steele, Mark McMillin and Johnny Campbell, and Chairman Mark McMillin in the ORMHOF booth at The Mint 400 with Robby Gordon's son, Max. Our programs and projects at the Hall of Fame are funded entirely through the generosity of our members, donors, and partners. Thank you to each and every one of you who has joined or renewed in the first quarter of 2019! It's Not Too Late to Join or Renew for 2019! 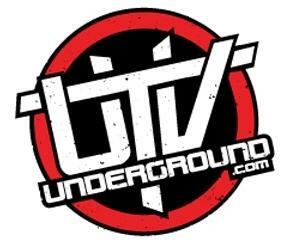 Annual Memberships: $25 Voting, $100 Individual, $1,000 Ironman, or Donate Any Amount, one time or monthly. Photos L-R: Vintage vehicles on display at the ORMHOF booth at The Mint 400, Hall of Fame Inductee wall at the Reno Expo, ORMHOF Mint 400 booth. 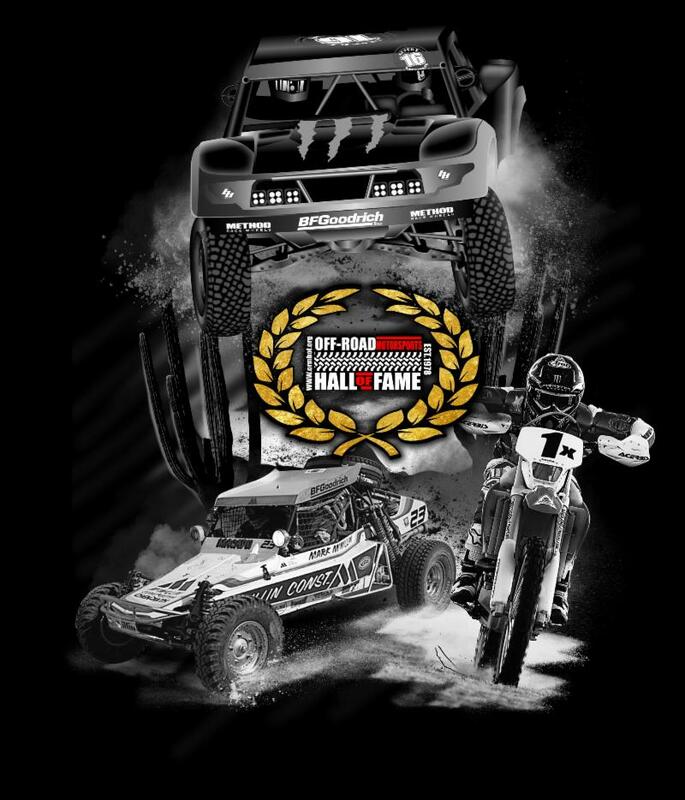 The Off-Road Motorsports Hall of Fame has been named a 2018 All Star Award winner by Constant Contact. 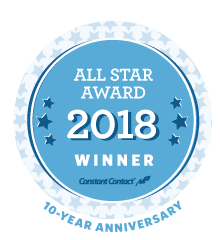 The annual award recognizes the most successful 10 percent of Constant Contact's customers, based on significant achievements using Constant Contact to engage their customer base. Criteria used to select this year's All Stars included levels of engagement; open, bounce, and click-through rates, and use of social sharing features. 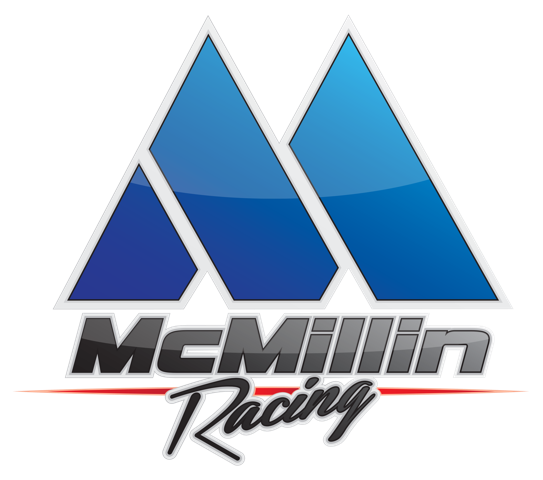 "The campaigns created by this year's All Stars demonstrate that a business, regardless of size, can accomplish their goals, and we celebrate the impressive achievements of the Off-Road Motorsports Hall of Fame with this All Star Award," said Holli Scott, Constant Contact Vice President. 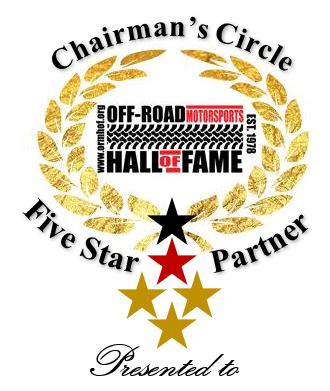 ORMHOF Chairman Mark McMillin is pleased to announce a new level of recognition for partner companies who have supported the Hall of Fame for five or more years with his Chairman's Circle Five Star Partner program. 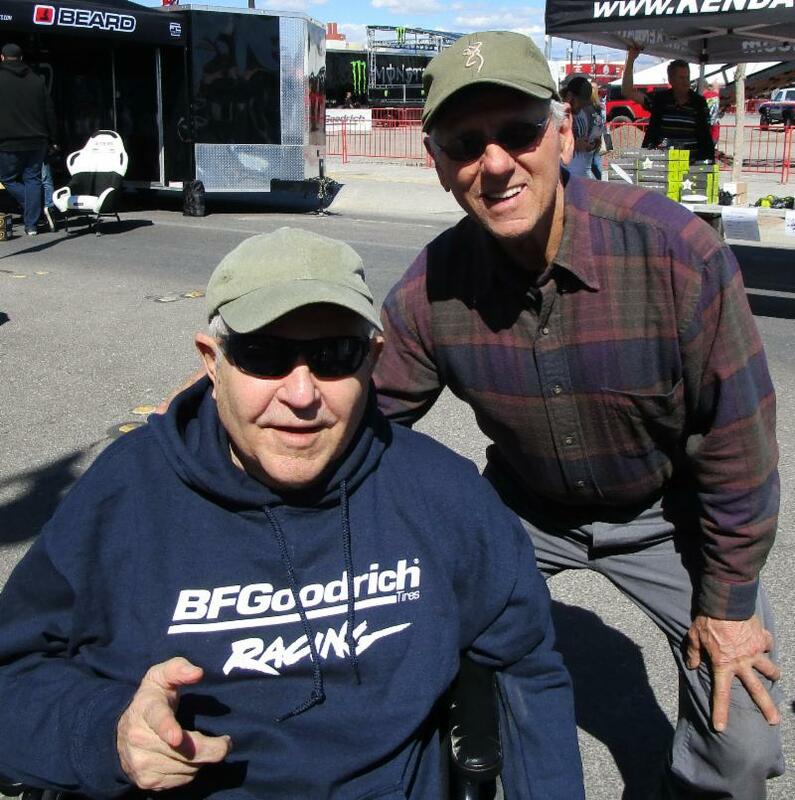 "Fulfilling the mission of the Off-Road Motorsports Hall of Fame takes the support of the entire off-road industry," says Mark. "That's why I'm pleased to give special recognition to the companies and individuals who have been with us for five or more years. Their support is key to our success." 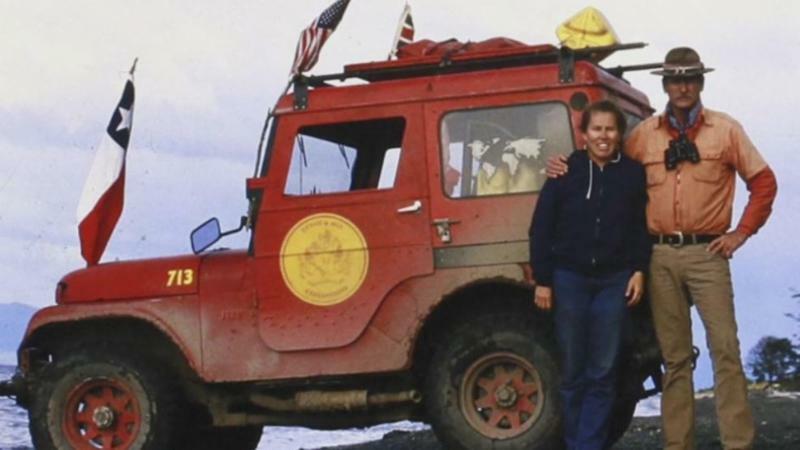 Pictured, above: American Adventurers Loren and Pat Upton with their 1966 CJ-5 Jeep, the Sand Ship Discovery, on their around the world quest in the mid-1980s. 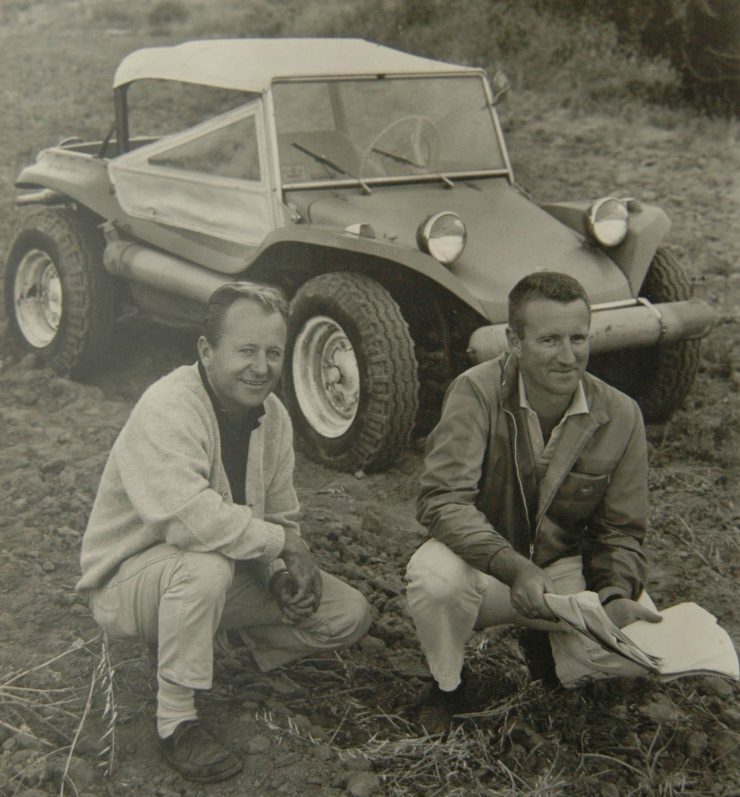 The Uptons goal was to drive ONE American made vehicle around the world on a north/south course -- ALL ON LAND -- except for the South Atlantic Ocean. The couple's 1980s journey, on their fourth attempt, took them from road's end at the Arctic Ocean in Prudhoe Bay, Alaska, to road's end at the Arctic Ocean in Gamvik, Norway, via road's end South America and South Africa. 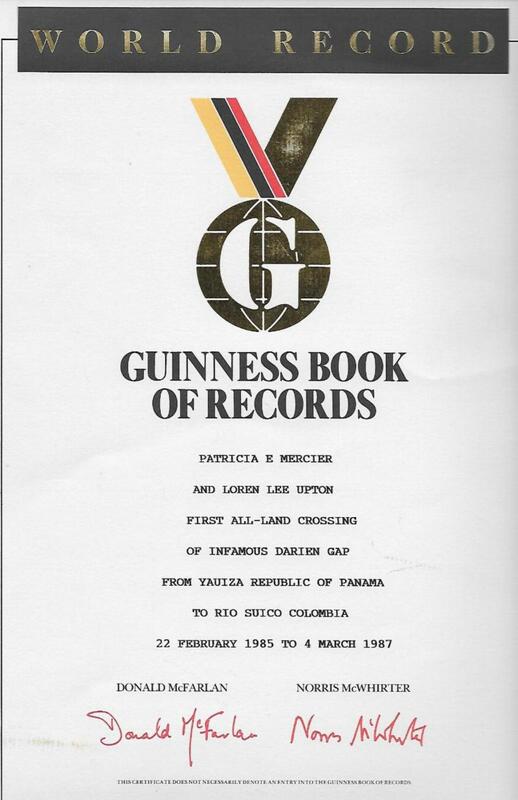 This route included the first all land crossing of the infamous Darien Gap of Panama and Colombia as recorded in the 1992 Guinness Book of World Records. Fast forward thirty years, to 2017, as the Uptons and the Sand Ship Discovery prepare to return to Israel to complete the final mile in their around the world journey. At 2:20 pm Jordanian time, on May 3, 2018, the little Jeep that could was cleared through an Israeli military checkpoint and traversed one single mile into the history books. ORMHOF looks forward to sharing more about the Uptons and their around the world journey, and hope to have the Sand Ship Discovery Jeep CJ-5 on display in the Hall of Fame Museum in Jean, Nevada, later this year. 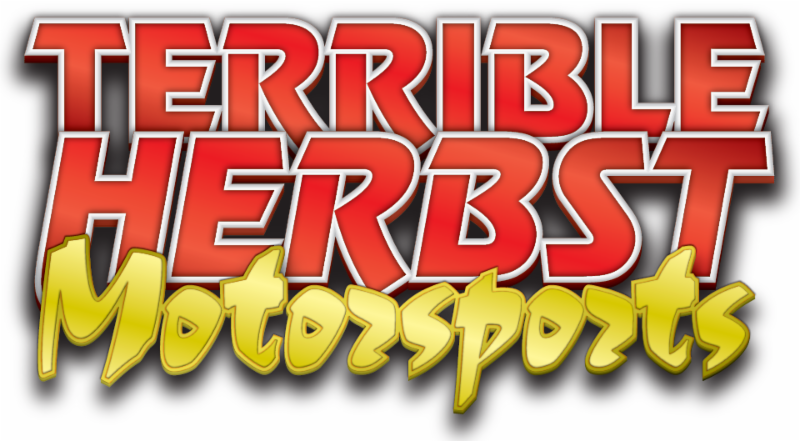 these businesses and individuals for their support of the Off-Road Motorsports Hall of Fame.